I have traveled many a mile onboard some of the finest cruise ships in the world. Without exception I have found people who are interested in a game of chess. The chess is casual with most games taking place during the days at sea. Many cruise ships have nice wood sets, but many years ago you would find the hollow red and black plastic pieces gracing a not so elegant board. Regardless of the sets the ship provides, I enjoy bringing a set or two and using them along with my vinyl board. Since I never take any sets home at the end of the cruise, I give away my sets to the people I play. In addition, I leave sets at some of our ports-of-call when I find a local who knows the game or at a school with a staff member who is willing to teach the game to young people. Some of the places I have left sets for schools are Ireland, Peru, Brazil (Amazon River village), Poland, China, Costa Rica and Egypt. Thus, I approached my latest cruise with great enthusiasm because I had just received the newest edition of the set I invented along with the assistance of Jay Blem, who recently passed away. The Ultimate Chess Set was produced many years ago, but just as I was about to sell my company, American Chess Equipment, the Chinese company that produced the set went out of business. Only recently, with the help of the ACE manager, Shelby Lohrman, and Wood Expressions, was the set reproduced. So, with the Ultimate set in hand I went up to the Explorations café on board the ship. This café is beside a library with its many books and maps of the world. My first step was to list myself in the register that informs people that chess will be played in the afternoon on sea days. Then, I set up my set and waited, reading a copy of Chess Life in the mean time. Many people walked by, and it did not take long before someone stopped to inquire if I would care for a game. One thing I have found on cruise ships is that there are periods when everyone has a lot of time on their hands. Sure enough Paul was one of those persons. 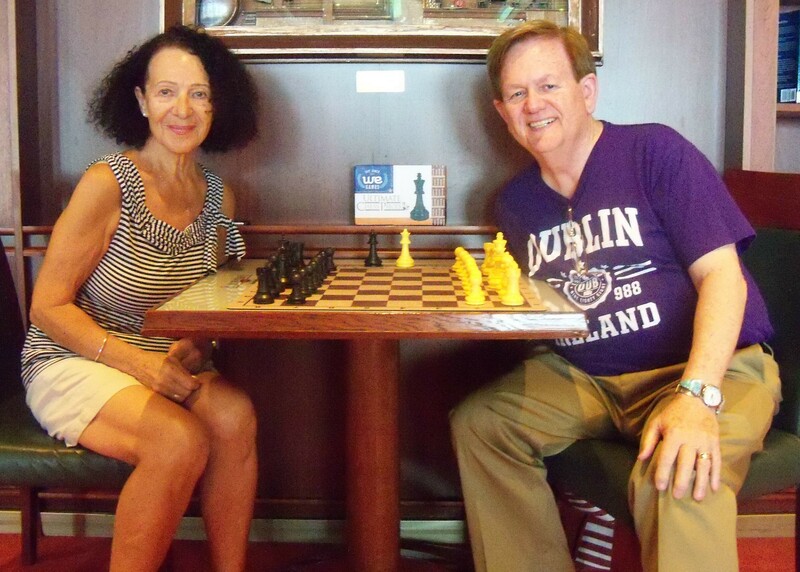 During the cruise we dueled many times over the board with both of us trading wins, losses and some draws. I replied, “Certainly, please have a seat.” Thus, began an adventure for both of us. Her name was Elizabeth, and she and her husband, Viktor, were traveling on the longer portion of this cruise around the world. My wife and I were only traveling from Hong Kong to Cape Town, South Africa. Elizabeth lives in British Colombia, Canada and was enjoying the long cruise with its many stops. I began the lesson by checking to see if she understood the letters and numbers on my newest board. The mousepad chess board is ideal for traveling because you can fold it in any direction you want and there will be no creases when you open it. Elizabeth was a fast learner. I discussed the importance of the center and development of pieces, especially the knights and bishops. In addition, I wanted to emphasize the importance of protecting the king. King safety often includes castling the king, and Elizabeth was able to grasp these major points with ease. We played several games and then I suggested that she record a game. She was very receptive to the idea because she knew that she could go over the game later and study the ideas. It was a pleasure working with her. I know Elizabeth will enjoy the Large Magnetic set as well as the Ultimate Set that I gave her. She recently e-mailed me to say she would be attending the Rotary International Conference in Toronto. While there, she hopes to put her newly acquired chess skills to the test. Finally, I never say goodbye because I never know where I will be in the world when someone will come up to me and say, “Care for a game?” It could even be someone I have met before, like Julian Cummings.